I keep coming back to this humble English Brown Ale recipe. If you frequently visit this blog, you’ll notice that there are certain beer styles I tend to rebrew on (at least) an annual basis. This is certainly the case with Northern English Brown. My affinity for brewing this beer mainly revolves around the fact that it is a low alcohol, sessionable, malt-forward ale that packs a lot of flavor into a fairly small package. The Maris Otter base gives an awesome bready, slightly toasty base, that is further enhanced with the addition of other melanoidin-rich specialty malts. Another reason that I frequently rebrew this style stems from the fact that back in 2012, I managed to score a gold medal in the final round of the National Homebrew Competition with a Northern English Brown ale. Every year since, I’ve attempted to recreate that beer’s magic by rebrewing very similar recipes and entering them back into the competition. I haven’t yet been able to get this beer back into the final round, although luckily, it is still a delicious beer to have on hand. This recipe is much more toast and melanoidin-forward than what is typical for the style, but I’m still holding out hope that I’ll eventually get it back onto the medal stand. Up front are medium to medium-plus esters that are quite British in their character, reminiscent of berry, cherry, and perhaps just a whisper of banana. There is a very high toasted bread crust aroma, rich in melanoidin, which has a Grape Nuts cereal character. Beyond the toast, is a bit of burnt sugar and deep toffee that almost approaches the dark fruit / raisin end of the spectrum. The nose is all about heavy malt that is not particularly delicate. The beer strikes a deep brown hue with reddish and copper highlights. The beer is generally clear, but does have some light haze. The beer has a big frothy head with plenty of persistence and lacing. This beer is all about big toasty malt. There isn’t much sweetness other than just a touch of dark fruit, caramel, and toffee. This is perhaps a bit out of style from the BJCP guidelines. On the finish, a very slight touch of drying roast is apparent, complemented by a bit of dark grain acidic twang. The bitterness is firm but smooth, keeping in balance with any residual sweetness. The heavy toastiness lingers through the finish becoming borderline astringent. The beer has a medium body with medium-plus carbonation that may be a bit out of style. The acidic tang in the flavor slightly curls the back edges of my tongue. This beer is intensely toasty and perhaps not as caramel-rich as the style guideline would dictate.The brash toast character detracts a bit from the smoothness I’d like to see in a style intended for sessionability. This is however a very characterful beer, especially considering the ABV of less than 5%. My tasting for the beer was completed only two weeks from brewday so perhaps it will mellow out with a bit more time. Bonus: See how judges scored this English Brown Ale at the 2017 National Homebrew Competition First Round (NYC judging center). 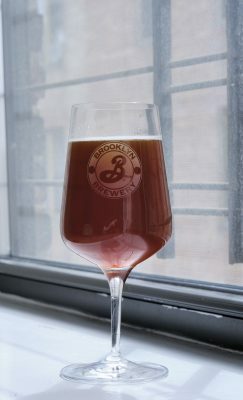 This entry was posted in Homebrew Recipes, Homebrew Tasting, Homebrewing and tagged ale, beer, british beer, english brown ale, homebrew, homebrewing, recipe, review by Nick Ladd. Bookmark the permalink. ©2002-2015 Nick Ladd. All Rights Reserved.